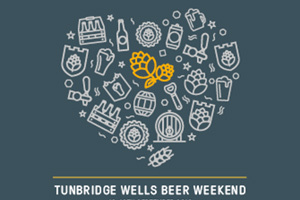 The Tunbridge Wells Beer Weekend will be a celebration of all things beer from 13-16 September 2018, from the history of brewing and hop farming in Royal Tunbridge Wells, to rare barrel tastings, home brew classes and walking tours! Pig & Porter will also be releasing a special collaborative beer brewed with the pubs of Tunbridge Wells to celebrate Beer Weekend which will be available in pubs locally throughout the weekend! Bavarian Beer Festival featuring the finest German beers, Bavarian food & maybe even an Oompah band! Fonthill Brewing (based under The George) will be brewing some historical beers from the archives of Tunbridge Wells Breweries gone by – available on the bar at The George all weekend. Tap Takeover with Pig & Porter and Signature Brew Co.
Cask Beer Festival featuring 15 ales plus live music Friday, Saturday & Sunday!